Four rounds have already been played in Dortmund and we have two leaders. Michael Adams and Vladmir Kramnik stand on top with 3/4 points. Wang Hao recovered from his first round blunder and won two out of three games to be the only player half a point behind the leaders. After breaking the 2800-barrier with his first win, defending champion Fabiano Caruana lost twice and needs to recover quickly if he wants to get a shot for the title. Today’s round saw three decisive games. 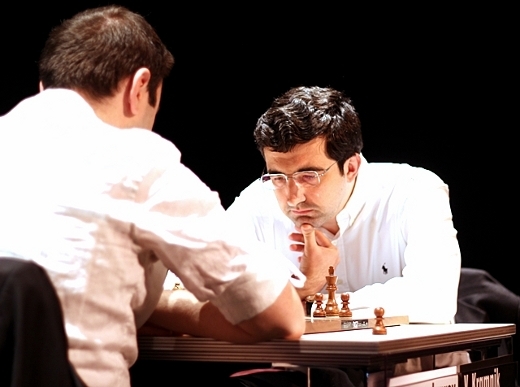 Vladimir Kramnik beat Georg Meier with black, Arkadij Naiditsch got his first win over out-of-form Dmitry Andreikin and Wang Hao used the white pieces to defeat Fabiano Caruana. The games were very tactical and entertaining for the spectators. Today’s win by Vladimir Kramnik over Georg Meier showed both the deep preparation and great tactical ability of the former world champion. After the gift he received in the first round, where Wang Hao blundered terribly, the Russian drew two German players. The victory obtained today puts him back in the fight to get his eleventh title at this prestigious tournament. Meier used one of Kramnik’s weapons, the Catalan. The Russian is known for his great knowledge of this opening with both colors, and proved it today. The fight began on the queenside, where black eventually won a pawn. Meier reacted going for a counterattack against the f7 square, but Kramnik used his queen as an effective defender. When black won a second pawn and closed the possibility of falling against a direct attack, the German decided to give up hopes. Two strong young players battled today. Wang Hao defeated Fabiano Caruana with white in a 39-moves game. This was Wang’s second win of the event and Caruana’s second loss. With the German players showing that they will not be easy targets, it will be hard for the Italian to recover, but it would be naive to rule him out completely. The Chinese opened with a Barcza system, and got the pair of bishops by move 13. Caruana activated his knights in the center but had to face his opponent’s counterplay on the kingside. The final blow came over the open h-file, where white put both his queen and rook in line. Caruana did not react correctly and gave up on move 30, when it is unavoidable to lose an important amount of material. Dmitry Andreikin is not having a good tournament. Today, he lost his third game against Germany’s number 1 Arkadij Naiditsch. The Russian did not show his class at the Universiade event in Kazan and continues his bad run at this strong invitational.